I have a 2000 Bounder Fleetwood, I have lost power to everything in the coach. I had running off my house 120 V when this happened. The only part that has power is the chassis. The only fuse box that I haven't checked is the one under the dash. What is the easiest way to get to it? The one under the dash for the chassis would have no effect on the coach power. Have you check the circuit breaker in the house to see if you are still sending power to the RV? Have you checked the main breaker inside the RV? If not one of those you might have a bad transfer switch or the RV 120VAC plug. Thanks, I have checked the breakers, Whatever it is has the power to the generator off as well. 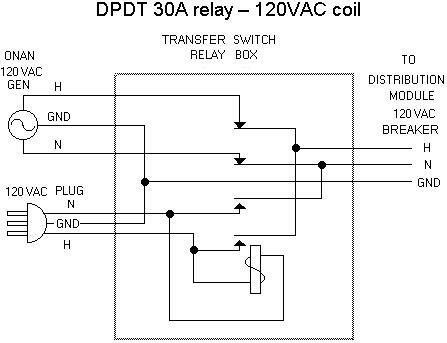 Sounds like the transfer switch. The transfer switch on most RVs is the link between the shore power cord and the power coming from the generator. The transfer switch then feeds the main breaker. I am not familiar with your 2000 Bounder Fleetwood model but that is how the generic RV input power is wired. Sometime when the transfer switch does not work you can unplug and replug a few time and the contacts will start conducting again. You should be able to hear the transfer switch switch each time the power is applied and then removed from the shore power cord. One, when you unplug, generator off, sits there not connected to anything. When you plug in, or fire up genny, it senses what you did and pulls in the prper set of contactors (relays or Solenoids Different names for same device based on size and voltage). The other kind, Defaults to Shore power, and only pulls in 30 seconds (or a minute) after sensing genrator,, Relays are spDT break before make. If you have the first.. That would be my guess as well. Second problem many RVers have is, Well the way I type it sounds like a joke, or insult, but is not. Many RVers have a few screws loose. When I had flakey operaton of my air conditioners the first thing I checked (Murphy took the day off it seems) was the breaker box.. one o the breakers the screw that holds the wire took over 2 full turns before I started to feel resistance, over 3 Full turns to tighten. (See I told you it was not a joke or insult) A #2 Square bit screwdriver is a handy tool. A 5er, brand new, sticker in the window new, plugged in on the site in front of me, NO POWER.. When we started the trouble shoot process the outlet end of the shore cord fell off in my hand, Six screws inside the outlet. Not one had been tightened. NOT ONE.